Did you know the Southern Conference and the Big South Conference are two different conferences? You do now. While the Big South had a better average ranking in KenPom last season, the league is weaker at the top, with no top 100 teams last year and just two in the top 150. 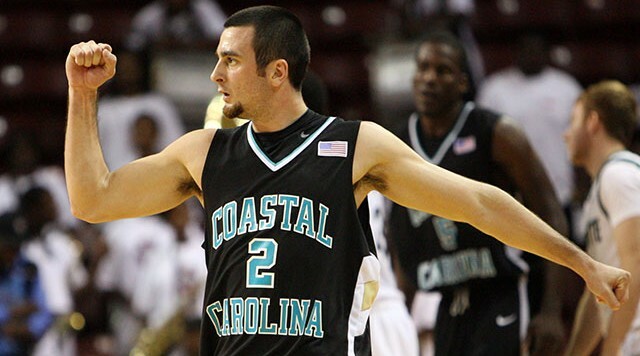 That’s part of why league champ Coastal Carolina was a 16 seed sacrificial lamb, and why the league’s conference champion might be in for the same fate this coming March. Coastal Carolina finished in a tie for third in the league last season with two other teams, but finished in a virtual tie with High Point for the best KenPom rating in the league. The Chanticleers lose a starter and a significant bench player to graduation, as well as two players who played sparingly to transfer, while High Point, whom Coastal swept, loses just one senior and no one to transfer, giving the Panthers the likely early upper hand. Although High Point has won the last three Big South regular season titles, the Panthers have never appeared in the NCAA tournament. Last season the Big South was one of the best offensive leagues in the country, with the average team scoring 1.07 points per possession in conference play and with every team other than Liberty scoring over a point per possession in league play. The Flames had the unenviable honor of finishing last in both offense and defense in league play, and with the team graduating two seniors it does not figure to get much better. Liberty won just four games against D-1 competition last season, and finished 329th in KenPom, so it doesn’t look like a fun season coming up in Lynchburg. The team looking most primed for a fall is Charleston Southern. The Buccaneers defeated NCAA tournament team Mississippi in their season opener, and finished the season with the best offense in the conference, scoring 1.15 points per possession, but a loss to Longwood in the first round of the conference tournament brought their season to a disappointing end. Charleston Southern loses its top three players, and four starters, off last year’s team, so even though they will be led by an accomplished senior, the Buccaneers could be headed for a finish close to the basement. The Big South hasn’t had a seed better than 16 since 2008 when Winthrop nabbed a 13 seed, though Coastal Carolina has given minor scares to 1 seeds in each of the last two seasons. Expect whichever team wins the conference tournament to get a 16 seed, but given how the Big South has performed in the recent couple of seasons, expect them to give whichever 1 seed they draw a bigger scare than they expect.